I used to read Variety regularly when I was in my show business phase, and I always turned to the obits. I loved finding out about people I never heard of and their interesting lives. It seems like show business people fall into two camps – either they die of a heart attack in their forties or they live on forever and die when they fall over the wash pail during the big Follies Hanukkah Show at the Home for Aged Actors in Poughkeepsie or Sherman Oaks at the age of 103. Either the pressure and the booze gets to you or it doesn’t. Take your choice. Rockers are different – they’re immersed in this weird macho rebel culture that revels in self-destruction. I’d go on at length except you’ve already heard it one hundred million times. Today I’d rather celebrate Mick and all the other rock survivors. In fact I think I’ll initiate a new department that will be in such charge of such celebrations. 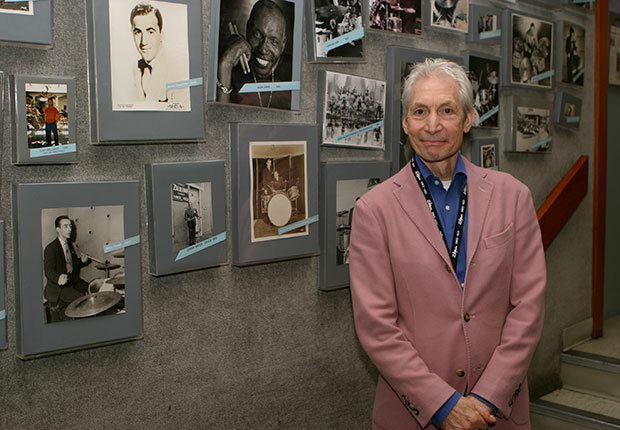 I’ll start with some other Stones: Hooray for drummer Charlie Watts – already 103 and busy practicing for their next world tour. And Hooray for Bill Wyman, their original bass player, who makes Charlie look like a pup. He retired like a man of wisdom and goes to the beach with his metal detector every morning, already over one million years old. Way to go, Bill! This entry was posted in Sixties Survivors and tagged rock music, Rolling Stones by ponderpig. Bookmark the permalink. Bill’s Rythmn Kings is a hot act. Lady singers and horns and everything. Check them out! What about that John Mayall for longevity? He’s gonna be 75 this fall and still going like gangbusters. Between now and the end of October, he’s gonna play over 30 dates. Hey. He’s like my dad’s age! Mayall’s on the list fer sure. On his birthday we’ll do a big story…if I remember. I’m busy in 1927 at the moment. Margaret and Leona just dropped into the Haight Street Drugstore for a phosphate. I’ve been listening in – the subject seems to be ‘who the heck are those kids from the future? Really. Do they go to Poly?’ Even Benny the soda jerk wants to know. Man, it’s great to be back. I love Margaret and Leona and I love the 1920s! I’m ready to rock. 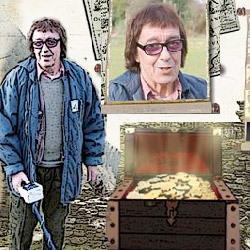 OK, maybe I was exaggerating a little about Bill Wyman. He’s not really one million years old. But he does like to go down to the beach with his metal detector when he’s not on tour. James Gurley, the original demolition-derby, rending-metal, Big Brother and The Holding Company guitarist, is turning 69 in December and good for him. Phil Lesh will also turn 69 next March and good for him. This is great – I’ve lived with you for almost forty years and you still make me laugh my head off! A working blues musician since 1927, he still performs regularly in Austin and at various blues festivals, most recently a week-and-a-half ago. He turned 95 on July 7. That’s a record, so to speak, that will be difficult, so to speak, to beat. OK, Pinetop Perkins is on the short list for glory in the Pondering Pig. But I’ve heard that Bill Wyman is already one million years old. I still have to check out the facts. While not top man, David “Honeyboy” Edwards has logged 93 years and still drives his Cadillac to gigs. He holds the sad honor of having been with Robert Johnson on that night in 1938 when he drank the poisoned whiskey. Going to be with Jesus a few days later, Johnson was dead at, yes, 27 years old. Trouble is I’m not listening to old Delta blues guys these days. My researches into the 1920s have led to an appreciation of flapperdom that I am still exploring. Names like Ruth Etting and Annette Hanshaw – they’re the singers who intrigue me. When I listen to the blues at the moment it’s Sidney Bechet or Louis Armstrong and His Hot Five. More the urban thing. Just wait till next week – Siberian juggler music. You’ll see. Shoot. I wuz hopin’ fer them Tibetan throat singers. Charles Edward Anderson Berry comes to mind. He, on October 18th, will be 82 years old. Something many of you didn’t know is that my first name is Maybelline. “If you tried to give rock and roll another name, you might call it ‘Chuck Berry’.” -The Other Walrus. A great one, Jinxie. He goes on the list. I wondered who listens to that old rock and roll anyhow. Well, now, you see. I am an aesthetic of sorts and while I appreciate the American rockers like Mr. Berry and Mr. Little and Mr. Diddley, I am a lifelong aficionado of the work of Mr. Anthony James Donegan, the “King of Skiffle”, who was a wee 71 when he passed in 2002. A good long life, I’d say. He’d be 147 by bovine reckoning. “Rock Island Line” moved me deeply (I have always enjoyed the lyrical nuances of Mr. Leadbetter) and, incidentally, was playing when I had my 11th calf, young Effie who now lives near Albany. Well, Lonnie is our family hero. “Rock O’ My Soul” and that song about the gum losing its flavor on the bedpost have made us laugh and cry and wish we could tap dance often. Mr. Bean used to play BBC on the short wave radio and we all got to hear. Jinx loved the hourly Westminster Chimes and the “This is London” announcement. He’d jump loops in the air and we were never sure if it was the chimes or the ditch weed he’d found behind the barn. Henrietta and the rest of the hens will disagree. They dropped strangely shaped eggs and cackled incessantly. I don’t really think they like chiming bells much. They did the same when the Methodist bells chimed on Sundays. Sometimes I wonder about chickens. We talk often, Effie and I, and she shares that when Mr. Lonnie recorded the “Skiffle Sessions” recordings with Mr. George Ivan Morrison, she was moved deeply and swore a skiffle oath for life. She heard Mr. Van’s mother Violet was a tap dancer and was affected deeply as well. For a long time I was threatened by Violet (we called her Vi) Morrison and her tap talents. Then I realized I can’t tap anyways. Whenever I try and lift my front left hoof when my front right is anywhere in the air, I fall forward, a most embarrassing tumble. The same happens in the back, but not as much blushing goes on. I just look like I’m sitting. I guess I had no reason to try and compare myself to Vi, silly me. But, well, a mom has a right to influence her children, doesn’t she? Maybe I should take a chill pill, as the children say, but I still worry about my calves and would prefer that they stick to the classics, like Mr. Donegan. One thing about an elderly talking cow. You can never be sure quite what she’s talking about. I remember a time when the animals on the Bean farm depended on her practical common sense. For instance, if Exxon posted a record $11.7 billion dollar profit for the quarter the same week that gas prices reached their record high ever, Mrs. Wiggins would have said, “You know, animals, there’s a connection here.” And when Charles the Rooster made a long-winded speech about needing to blast apart the American wilderness to find more domestic oil, Mrs. Wiggins would have shut him up fast by pointing out that reining in the obscene profits of the super-rich oil companies would be a better place to start. But no – today the animals can’t connect the dots anymore and Mrs. Wiggins has gone dotty. Sorry, Pig. The silage has started to turn to sour mash and I get a little tipsy on occasion. I couldn’t see any of the pictures on this post, by the way. Never mind, now I do.